Santa Rosa, Calif.—The Sonoma County Winegrowers (SCW) are excited to announce their 2015/2016 Commissioners, including seven incumbents, as well as the election of one new and two past Commissioners representing some of Sonoma County’s top vineyard properties, families, regions, and industry leaders. Commission incumbents who were re-confirmed to the board include : Kevin Barr of Redwood Empire Vineyard Management, Domenico Carinalli of Carinalli Vineyard, Douglas McIlroy of Aquarius Ranch Associates, Richard Mounts of Mounts Family Vineyard, Vickie Mulas of Mulas Family Vineyards, Glenn Procter of Puccioni Ranch, and Brent Young of Jordan Vineyard & Winery. New to the Commission is Marissa Ledbetter, a 4th generation farmer who is Vice President of Operations for her family’s Vino Farms. Ledbetter’s family has been respected for farming winegrapes in Sonoma County since the 1970’s. Returning to the Commission are Duff Bevill, Founder & Partner at Bevill Vineyard Management, as well as the Commission’s Founding Chairman; and Joe Dutton, a 5th generation winegrower and co-owner of Dutton Ranch, whose family has been farming in Sonoma County since the late 1800’s and growing winegrapes since 1964 in Russian River Valley. Several respected Commissioners termed out, including John Balletto of Balletto Vineyards, Vicki Michalczyk of Hawk Hill Vineyard and Steve Sangiacomo of Sangiacomo Family Vineyards. During their July Commission Board meeting, the Commission unanimously elected Kevin Barr as Chairman of the Board, Joe Dutton as Vice Chairman, and Mark Sanchietti as Treasurer. 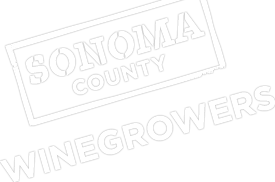 The 2015/2016 Sonoma County Winegrowers Commissioners are: Kevin Barr (Chairman), Joe Dutton (Vice Chairman), Mark Sanchietti (Treasurer), Duff Bevill (Founding Chairman), Doug McIlroy, Glenn Proctor, Bret Munselle, Dan Rotlisberger, Brad Petersen (Past Chairman), George Martinelli and Ray Johnson (Public Member At-Large). Commission Alternates include : Brent Young, Vickie Mulas, Richard Mounts (Past Treasurer), Marissa Ledbetter, Domenic Carinalli, Mark Pasternak, Richard Schaefers, Joe Judge, Joe Battaglini, Anna Darden and Rhonda Smith (Public Member At-Large).